This wonderful mussel recipe comes from Barcelona, the Spanish tapas restaurant in Connecticut. 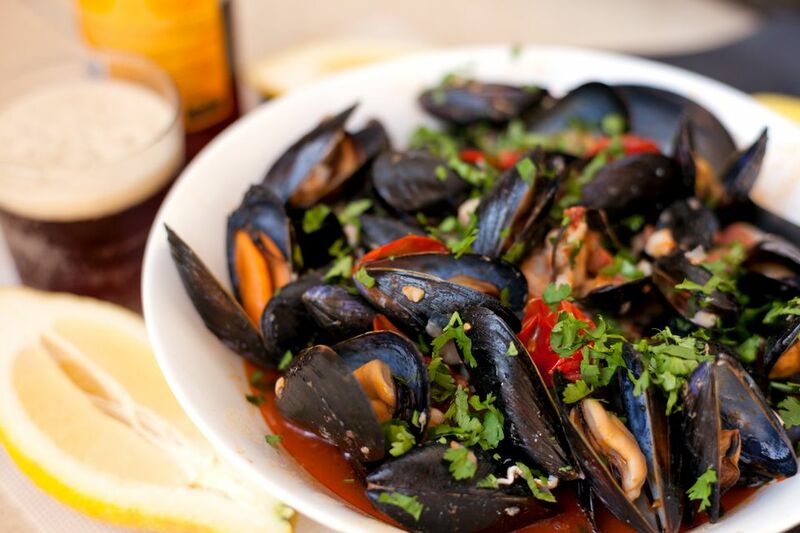 Simple ingredients: tomatoes, garlic, white wine and a little spice turn mussels into something spectacular. Reprinted with permission from The Barcelona Cookbook by Sasa Mahr-Bautz (Andrews McMeel, June 2009). Pour the remaining 1/2 cup of olive oil into a large sauté pan and heat over medium heat. Add the garlic and cook for 2 to 3 minutes, or until lightly browned. Add the mussels, tomatoes, bay leaf and pepper flakes and season with salt to taste. Stir well and cook for about 15 minutes. Pour the mussels and the sauce into a large serving bowl. Garnish with parsley and drizzle with extra-virgin olive oil. Serve the bowl with the croutons and serve.